Squibs And Crackers: Works For Me! "Mom, I'm thirsty!" How many times do we hear those words everyday? I would be getting drinks all day if I got their water myself. 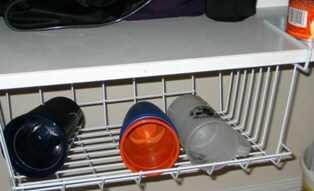 I slipped on a wire basket on the shelf in my pantry where we keep the plastic drinking glasses for my children. This way they can get their own drinks without climbing on my cupboards to get a glass that can be broken. And that works for me! I want to intall a drinking fountain in my house (when I'm rich and have a house)...that way there's no whining or glasses to deal with at all.